Perfect for themed, holdiay and everyday gift giving! Great for creating custom wire ribbon bows, wreaths, craft projects and more! 1 Roll of red and black tartan with gold trimmed wired edge ribbon. The perfect gift deserves the perfect ribbon bow presentation! Choose from our huge selection of wired edge decorative ribbons and get the presentation of a professional gift wrapper. 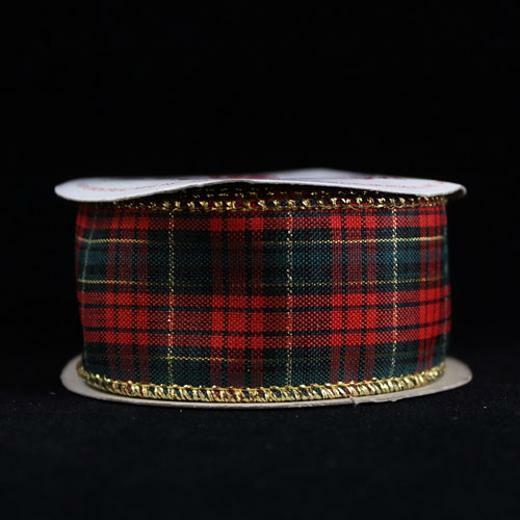 This wired edge ribbon is perfect for creating custom bows, wreaths and crafts. The sparkling gold edge perfectly accents the colorful ribbon creating an elegant effect.! Ribbons are ideal for decoration, holiday gift wrapping, making bows, and more. Check out our full line of other assorted color ribbons for any occasion. Ribbon measures 1 3/8" inches wide by 3 yards long. 1 3/8 in. X 3 yd.